Seven Pines is a wonderful neighborhood located in Creve Coeur off of Fee Fee rd. Creve Coeur is an outstanding, unique, safe, and lively community. Conveniently located in West St. Louis County, Creve Coeur's Seven Pines neighbors Town and Country. Depending on which side of Creve Coeur you reside, your children will attend Ladue School District or Parkway School District. Both of these districts have exceptional ratings as Top Schools in Missouri. Ladue High School has a 99% graduation rate and Newsweek in 2013, ranked the public school 166th best in the nation (up from 188th in 2011-12), and first in Missouri (up from fourth). Parkway School District is a triple A rated school, consistently receiving a "9 out of 10" district rating. Seven Pines offers a community pool, park and lots of events! You can play at the private neighborhood's Arrowhead Park, join the swim team, garden club or book club! The park offers playground equipment, a large grassy field for sports, picnics, and relaxation! The pool offers diving boards, a snack shop and a separate baby pool for the little ones. Guests are welcome to join in the fun if attending with a resident member. This community also offers a "Yard of the Month" promotion. Winners receive a gift card and recognition on the communities website. It makes the neighborhood even more pleasant with the lawns being mowed and flowers being planted! There's also a Garden Club available for those who have a green thumb. Members of the Garden Club meet about ten times a year, planting and planning on how to make Seven Pines community even more beautiful. Throw yourself in Seven Pines Book club if you love to read exciting novels. With this close community, there's always things to do and volunteering opportunities. Come see what Seven Pines has to offer you! Local attractions include the AMC West Olive 16, That Painting Spot, The New Jewish Theatre, The Butterfly House, and Holocaust Museum and Learning Center. Also, Creve Coeur offers an Ice Arena, Golf Course, Creve Coeur Zip Line, Farmers Market and Creve Coeur Dog Park! 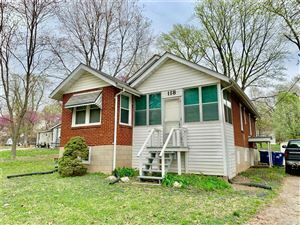 You'll get a lot of bang for your buck in Creve Coeur with the housing market and all the town has to offer!